Go to the Story Maps Apps to browse the application templates and choose the best one for your story map project. Each app lets you deliver a specific user experience to your audience. There are apps for map-based tours, collections of points of interest, in-depth narratives, presenting multiple maps, etc. See the Tutorial tab for the story map application template you chose for instructions on how to proceed. 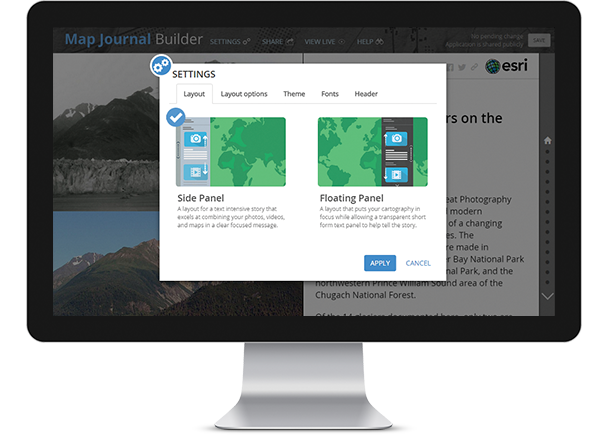 For example, here is the Tutorial for the Story Map Journal application template. When you’ve finished, you simply share your story map to launch it and make it go live. You can share it publicly or restrict it so it can be accessed only by people in your organization. To promote the story map to your audience, you can add links to it, embed it into your website, write a blog post about it, and share it on social media. Get started with Story Maps today.